Manhattan, NY (October 3, 2018) – A six-alarm fire broke out Wednesday morning, October 2, on First Avenue in the East Village that resulted in the injuries of 14 firefighters and 3 residents. 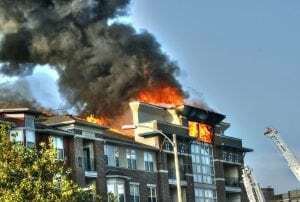 The fire occurred on the first floor of a five-story apartment building and caused serious problems for firefighters. The fire was reported to have started at around 1:45 a.m.
Officials stated that the flames spread to a small section in the back of the building, which could not be accessed by firefighters due to a portion of the building collapsing. Five buildings nearby the fire had to be evacuated because of the heavy smoke. Among the numerous firefighters who were at the scene, 14 had to be treated for injuries that were mostly caused by smoke inhalation and heat exhaustion. Three residents in the building were also reported to have sustained minor injuries during the fire. The Red Cross is currently housing 13 residents as the structural integrity of the damaged building and three adjacent buildings are thoroughly examined. Authorities are actively investigating the cause of the fire. We would like to extend our warmest wishes to all those hurt in this fire as we extend our gratitude to the New York firefighters who risked their lives. A Fire in New York can often prove to be extremely deadly and are among one of the most dangerous situations for anyone to encounter. It is important to understand that you have the right to be compensated for your losses in the event that you have been injured in a New York fire due to someone else’s negligence. At Hach & Rose, our compassionate New York accident lawyers are dedicated to helping those affected by the carelessness of others. If you have been injured in a New York fire or explosion, please call 212-779-0057 and let us go to work on your behalf.